I am a creature of habit. I think that may be why starting a new semester always has me feeling a little overwhelmed and disorganized. This feeling of disorganization is always a hard way to kick off the new year especially when organization is a primary goal. Ironically enough, in The Happiness Journal I started last week (I'd highly recommend!) the list to make this week was the routines you have established in your life. Cue me rolling my eyes while I filled this out on Sunday night. Being out of routine makes me that much more appreciative of the routines I have established in college. As I was writing out the different routines I typically have going each day/week it helped me to think about how I can start to implement these in my new schedule this semester. Thinking through all of this made me think about what other routines I could implement in my own life to make my days or weeks go smoothly. I thought I'd share some of the ones I have in place (and am attempting to get back into this semester) with hopes that you'll share your routines with me as well. If I had to guess I'd say about 60% of college students rely on doing college on Sunday afternoons. That or put it off until they are on their last pair of socks and underwear. If you're lucky enough to have a washer and dryer in your individual apartment I am jealous! We have 2 laundry rooms in my building so timing is everything when it comes to laundry. My biggest recommendation if you're in the same boat is to find some time during the week to do your laundry. Last semester on Fridays I finished class right around lunch time. I would go to lunch with friends and then come back to my apartment and start some laundry while finally taking some time to relax after the week. Doing it at this time I never had to wait! I'm not positive about when doing laundry will be accomplished this semester but I'll be doing my best to avoid Sunday afternoons. In college with a busy schedule cleaning doesn't always take priority. While yes, I make my bed pretty much every day vacuuming and wiping down counters aren't chores that you think about doing as often. A lot of times I'll prioritize cleaning of this nature (including cleaning our bathroom area) while my laundry is in the washer. By having a set time to do this during the week I don't have to worry about my room or apartment getting super dirty over an extended period of time. I feel like morning routines are a bit self explanatory. Do what works for you to be ready to go by the time you need to leave. Personally, I am more productive in the morning so I like to get up a lot earlier than I need to be somewhere in order to get stuff done. My typical routine involves me getting out of bed, going to the bathroom, and brushing my teeth. Then I make my bed, straighten my hair, and put on makeup. Sometimes I'll make breakfast and a cup of coffee before that but more often than not I don't do that until I've gotten dressed and am preparing to head out the door. My night routine works in pretty much the same way as my morning routine although the time in which I am doing things is a little bit different. I workout at night so I also shower at night so that's where my routine typically begins. After blow drying my hair and getting into pajamas I typically work on some more homework or blog work while starting to wind down. If y'all are dying to see a post about my morning or night routine I can go more in depth then. While I tend to work on things at night before bed I also really enjoy having time to go to the library to be productive during the day. My friends have a tendency to make fun of my love of the library but it's an environment that is quite and encourages me to do my work so I'd much prefer to work on assignments there. Assigning a 2 to 3 hour block each day to serve as your own personal study hall really helps me accomplish my tasks. The first couple of weeks back after Christmas break are always a bit tricky when it comes to fitness because of recruitment. My favorite workout is barre 3 so I like to work as many of those classes into my schedule as possible. I've found that booking classes in advance or setting up a workout with friends keeps me much more accountable. Working out is a huge stress reliever for me so making a routine of it is pretty important to my mental health when it comes to school! This is a constant work in progress for me considering I have a wonderful tendency to end up at the grocery store when I'm hungry. I'm hoping to get on some sort of grocery shopping routine this semester so that I'm not having to run to the store at the last minute before making dinner! What other routines do you find important to establish at the start of your new semester? I wish I followed these tips when I was in college... or even now, actually! These routines are so important! If you can start them in college, you can easily adjust them once you graduate. That's probably a lot easier than starting them all after you graduate, which is what I did. I didn't think I needed them and now I totally know that I did! These are great habits no matter what stage of life you are in! I agree with others, that having routines benefits you at all stages of life. I post for college students as well, so I appreciate hearing these from you. I know one follower who found Tuesday mornings to be the perfect laundry time. No one was there so she could get it all done quickly. Establishing a laundry schedule is so helpful in college! When I lived in the dorms, it was so important to learn when the busiest times for laundry was. It's not fun having your wet laundry in a bag because all the dryers are taken up. I used to do my laundry on the weekdays around mid-day because everyone was still in class. Doing laundry in a dorm environment was always so stressful - I love having my own laundry room in my apartment now because I can do laundry whenever I have free time rather than having to strategically plan it around when the washing machines were available. A grocery shopping routine is definitely the routine of mine that needs the most work - I'm the worst about waiting to grocery shop until I've completely exhausted all other options. I remember when I was in college that I thrived off of a strict routine and need to find a way to transfer that over into "the real world" now. Great tips! I like to think I am a free soul but having a routine can make a huge difference. Some things need to be put into a routine. 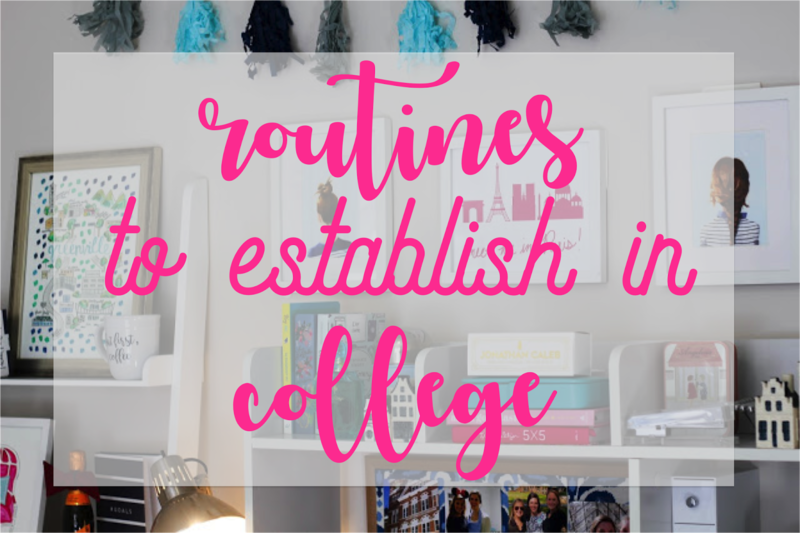 I definitely am a fan of routines and I will definitely be saving this for when I head off to college in the fall!